Models 933, 1453, 2903 and 6503 constitute a new development in lifting mechanisms. These are essentially motorized winches for raising and lowering gym divider curtains using single or double line rigging. These models can also be used to individually operate multiple line lift curtains and for this application can be installed side by side in a relatively small area for mounting either on the floor or overhead. These units are not equipped with magnetic friction brakes so some drifting may occur. A high gear reduction is used to help limit this drift and provide more precise stopping. Stop, Start and Reverse control is provided by a reversing motor and three-position toggle type control switch. Integral rotary limit switches allow for pre-set "Full Raise" and "Full Lower" positions. Rotary Limit Switches for full open and full closed positions. 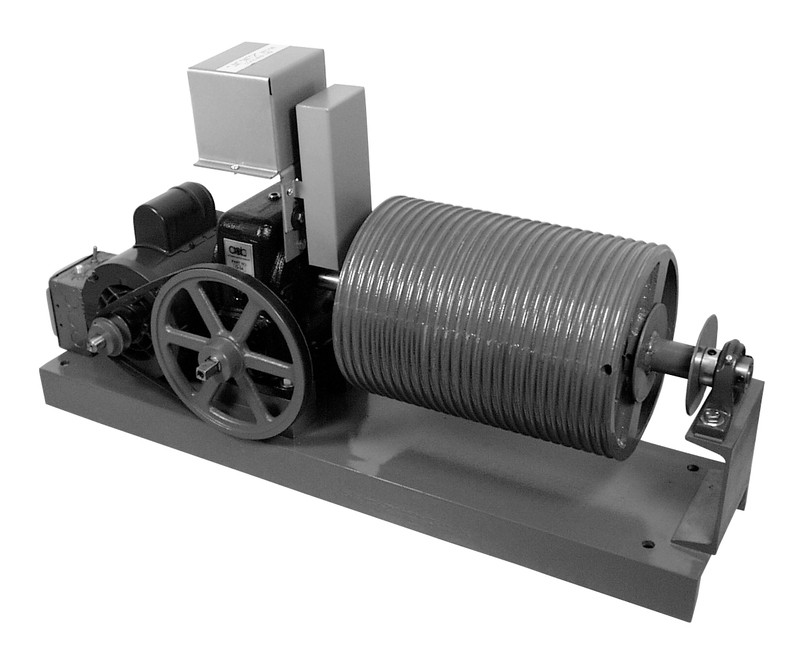 Curtain machines shall be fully automatic type equipped with ... HP special reversing motor connected through V-belt drive to single reduction gear unit, on the output shaft of which shall be mounted elevator-type cable drum delivering lifting speed of 18.6 feet per minute and secondary spool delivering cable speed of 2.7 feet per minute. Remote control station shall provide reversing action at any point along elevated travel and shall be composed of three-position, maintained toggle-type switch. Rotary limit switch shall be driven from output shaft of gear reduction unit. Machine shall be equipped with disconnect switch, overload protective breaker, and emergency hand crank for conversion to hand operation. The entire mechanism shall be mounted on a steel base. Model ... as manufactured by Automatic Devices Company of Allentown, PA.